"Just because I work for the federal government doesn't mean I'm an expert on cockroaches." ACTUAL DOCUMENTED ACCOUNT: Cockroaches! Possibly from space! While Scully is on the phone! REVIEW: Darin Morgan strikes again. This time, his subversion of the X-Files formula plays with the concept of Scully's knack for the so-called reasonable explanation. Every time Mulder calls her about a new death or strange happening re: mystery cockroaches, she gives him a reason not to have her come up to Connecticut's answer to Eureka. And so she almost sits this one out, frustrated that she might be missing something good because, for once, Mulder seems to accept her explanations. Or he's found a Scully surrogate in the impossibly hot Dr. Bambi Berenbaum (played by Bobbie Phillips, who I remember from Murder One at the time), an entomologist, not a Bond girl despite appearances and nomenclature, an amusing reversal of his platonic relationship with Scully (he seems much more interested in her debunking of UFOs as bioluminescent insect swarms, for some reason). And it's a play on Scully's stoicism as well, having her deal with Mulder on the phone, at more than the usual arm's length, while cleaning her dog or eating ice cream. If the episode irreverently deals with its leads and tropes, it also pushes the boundaries of what television usually deems in good taste. Morgan has, after all, written an episode called "War of the Dung Eaters" (I'm being as clean as can be here), and sets his climax in a stinky methane plant, manure splashing all over our agents ("Crap.") while earlier, a man died on the toilet from straining too hard. The cockroaches are apparently well hung (is that supposed to be a double entendre?). And how about the prognosticating exterminator who brands himself "Dr. Bugger"? 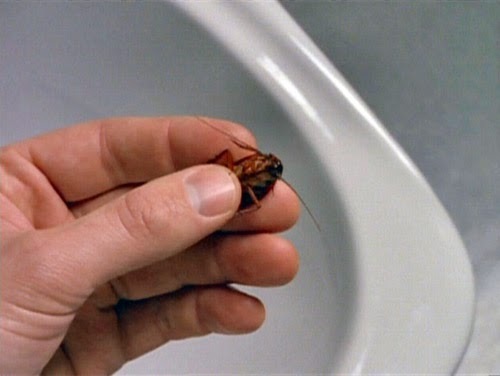 The episode is in fact so irreverent, it actually lets a cockroach crawl over YOUR tv screen as a joke. Did anyone swat at their sets, I wonder? And it MIGHT just be a step too meta. Haven't decided yet. But plenty of good jokes in the script besides. Scully's jealousy of Bambi. The roboticist whose creations are patently ridiculous. The hysteria over spilled candy. Mulder's glitchy computer screen narration. I giggled often. The notion that the bugs were probes from outer space is far less ridiculous in comparison, so the humor is very much the method used to make us believe it might be true. As Morgan did in Humbug, there are a lot of red herrings playing out as elaborate jokes (though it leaves us with the question of what attracted the robot roaches to the sites of the victims' impending deaths). Making a praying mantis Mulder's first "alien encounter" is a fun addition as well. I've been out of the loop on your X-Files reviews, but I'm starting to catch up on them now. Good work, as always! When I was first watching the show as an earnest teenager, I wasn't keen on the irreverent episodes, but I appreciated them a lot more on rewatching years later. I think the format-breaking ones probably did get a bit tedious over the run of the show, but Darin Morgan definitely had a knack with them. Scully's delivery of "Her name is Bambi?" is hilarious and perfect. Note the scene where Scully is reading Breakfast At Tiffany's--that's a good-natured jibe at Duchovny, who incorrectly answered a question about the book/movie for Final Jeopardy when he was on Celebrity Jeopardy. Apparently Gillian Anderson had some scheduling issues during production (hosting SNL, I vaguely sorta recall? ), so the "excuses not to come to Connecticut" was Morgan's way to get around that with a 1/2-Scully lite episode. It turned out brilliantly; sometimes it's all about serendipity. There are other little jokes as well, like Miller's Grove, the same town used in Orson Welles' War of the Worlds broadcast, and Sheriff Frass... frass is caterpillar dung.